The Hypogeum was discovered by accident in 1902 when workers cutting cisterns for a new housing development broke through its roof. The workers tried to hide the temple at first, but eventually it was found. The study of the structure was first conducted by Manuel Magri, who directed the excavations on behalf of the Museums Committee, starting from November 1903. During the excavations, a portion of the contents of the Hypogeum, including grave goods and human remains, were emptied out and discarded without being properly catalogued. To confound things further, Magri died in 1907 while conducting missionary work in Tunisia and his report on the Hypogeum was lost. Excavation continued under Sir Themistocles Zammit, who attempted to salvage what he could. Zammit began publishing a series of reports in 1910 and continued excavating until 1911, depositing his findings at the National Museum of Archaeology in Valletta. The Hypogeum was first opened to visitors in 1908 while the excavations were ongoing. Real attempts to preserve the site started in 1991 when it closed for a decade to arrange it for visits. In 2011, a more intensive program was launched to monitor the decay of the site. The Hypogeum reopened in May 2017 after closing for a year to improve its environmental management system. The temple structure uses a careful direction of light from the surface to penetrate into the lower chambers, with intricate patterns painted on portions of the ceiling with red ocher, following motifs of spots, spirals and honeycombs. One of the main chambers, called "The Holy of Holies", appears to be oriented such that light from the winter solstice illuminated its facade from the original opening above. A resonance niche cut in the middle chamber, called the Oracle Room, was possibly designed to project chanting or drumming throughout the rest of the Hypogeum. The hypogeum has the specificity to resonate exactly on 111 Hz, the sacred resonance. A broad range of objects were recovered from the site, including intricately decorated pottery vessels, stone and clay beads, shell buttons, amulets, axe-heads, and carved figures depicting humans and animals. The most notable discovery was the Sleeping Lady, a clay figure thought to represent a mother goddess. The figures range from abstract to realistic in style, with major themes thought to be related to veneration of the dead and spiritual transformation. Complex artistic techniques are also represented, as in the case of a single large pottery bowl which utilized both naturalistic and stylized themes, with one side realistically depicting bovines, pigs and goats, and the other side representing hatched animals hidden within complex geometric patterns. The remains of some 7,000 individuals were found in the Hypogeum, and though many of the bones were lost early in excavation, most of the skulls were deposited at the National Museum. A small percentage of the skulls have an abnormal cranial elongation, similar to priestly skulls from Ancient Egypt, fueling speculation about the people who occupied the Hypogeum, and their practices and beliefs. Further excavations took place between 1990 and 1993 by Anthony Pace, Nathaniel Cutajar and Reuben Grima. The Hypogeum was then closed to visitors between 1991 and 2000 for restoration works; and since its reopening, Heritage Malta (the government body that looks after historical sites) allows entry to only 80 people per day, while the site's microclimate is strictly regulated. Scientific research on the Hypogeum is ongoing, and in 2014, an international team of scientists visited to study acoustics. The Hypogeum is constructed entirely underground and consists of three superimposed levels hewn into soft globigerina limestone, with its halls and chambers interconnected through a labyrinthine series of steps, lintels and doorways. The upper level is thought to have been occupied first, with the middle and lowers levels expanded and excavated later. Some of the middle chambers appear to share stylistic characteristics with the contemporaneous Megalithic Temples found across Malta. The first level is only ten metres below the surface, and it is very similar to tombs found in Xemxija, near St. Paul's Bay. Some rooms are natural caves which were later artificially extended. This level consists of many chambers, some of which were used for burial. Main Chamber: This chamber is roughly circular and carved out from rock. A number of trilithon entrances are represented, some blind, and others leading to another chamber. Most of the wall surface has received a red wash of ochre. It was from this room that the Sleeping Lady was recovered. Oracle Room: This is roughly rectangular and one of the smallest side chambers. It has the peculiarity of producing a powerful acoustic resonance from any vocalization made inside it. This room has an elaborately painted ceiling, consisting of spirals in red ochre with circular spots and spirals. Decorated Room: Near the Oracle Room is another spacious hall, circular, with inward slanting smooth walls, richly decorated in a geometrical pattern of spirals. On the right side wall of the entrance is a petrosomatoglyph of a human hand carved into the rock (Agius). Holy of Holies: Perhaps the central structure of the Hypogeum, this room appeares to be oriented toward the winter solstice, which would have illuminated its facade from the original surface opening. No bones were recovered from this room during excavations. The focal point is a porthole within a trilithon, or structure consisting of two large vertical stones, which is in turn framed within a larger trilithon and yet another large trilithon. The corbelled ceiling has been taken as a hint that Malta's surface temples, now uncovered, could have been roofed similarly. The lower story contained no bones or offerings, only water. It strongly suggests[according to whom?] storage, probably of grain. The Hypogeum and its museum are a popular attraction in Malta. The museum is open at 9am, but queuing for tickets starts around 8am. Some last minute tickets are occasionally available from the National War Museum, located in Valletta. Visitors are recommended to book weeks before, as limited people are allowed per day. The site closed in September 2016 for a €1.1 million renovation partly financed by a grant from Iceland, Norway, and Liechtenstein. The renovated museum was inaugurated by Minister for Culture Owen Bonnici on 28 April 2017 and includes a new climate control system for the Hypogeum as well as an expanded visitor centre. The site reopened to visitors on May 15, 2017. ^ a b c d e Sagona, Claudia (2015). The Archaeology of Malta: From the Neolithic through the Roman Period. Cambridge University Press. ISBN 1107006694. ^ a b c d e f g McDonald, Neil (2016). Malta & Gozo A Megalithic Journey. lulu.com. ISBN 132659835X. 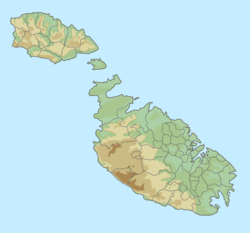 ^ a b "The Death Cults of Prehistoric Malta". Scientific American. Retrieved 10 March 2016. ^ a b c Haughton, Brian (2008). Haunted Spaces, Sacred Places. New Page Books. ISBN 160163000X. ^ "Ħal Saflieni Hypogeum". Heritage Malta. Retrieved 4 December 2014. ^ a b c d e f g "Ħal Saflieni Hypogeum". UNESCO. Retrieved 4 December 2014. ^ a b Magli, Giulio (2009). Mysteries and Discoveries of Archaeoastronomy: From Giza to Easter Island. Copernicus. ISBN 0387765646. ^ Kelly, Lynne (2017). The Memory Code: The Secrets of Stonehenge, Easter Island and Other Ancient Monuments. Pegasus Books. ISBN 1681773252. ^ a b "The Mysterious Disappearance of the Maltese Skulls". Hera Magazine, Italy. 1999. ^ "The Hal Saflieni Hypogeum". maltassist.com. Retrieved 4 December 2014. ^ Pace, Anthony (2004). The Ħal Saflieni Hypogeum Paola. Santa Venera: Midsea Books Ltd. ISBN 9993239933. ^ "International team of scientists to study hypogeum acoustics". Times of Malta. 21 January 2014. Retrieved 4 December 2014. ^ "Revamped Ħal Saflieni Hypogeum inaugurated". Times of Malta. 28 April 2017. Retrieved 5 May 2017. ^ "Hal Saflieni Hypogeum to re-open on 15 May". TVM News. 29 March 2017. Retrieved 5 May 2017. Jim Diamond. "Malta Temples". Retrieved October 22, 2006. Agius, A. J. The Hypogeum at Hal-Saflieni. Malta: Freedom Press. p. 19. Wikimedia Commons has media related to Hypogeum of Ħal-Saflieni.